Generally the songs that you have on your hard drive are probably stored in individual files – and in most cases that makes a lot of sense seeing as it allows you to choose individual songs as opposed to having to scan through a file to locate the song that you want to listen to. However there are certain situations where being able to combine songs can help, such as when you want to create a long-play track, background music for a video, or your very own music session of sorts. Add the songs that you want to combine by clicking on ‘Add Media Files’ and selecting them. Move the songs around in the ‘Timeline’ so that the sequence is right. 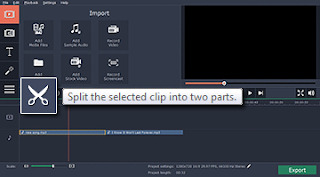 Save the video by clicking ‘Export’ and selecting an audio format (such as MP3) or using one of the presets that are available. Needless to say, having such a quick and easy way of merging songs is definitely useful – but on top of that the Movavi Video Editor provides an added bonus: It will let you trim your songs while you merge them too. By cutting out ‘dead audio’ at the start or end of your songs, or even just trimming entire sections so that only the parts you want are being used – you will have full control over the final result. Assuming you want to add the combined song to a video you can do so easily with the Movavi Video Editor too, and then apply special effects, add customizable text, enhance the video quality, and even cut and combine video segments too. The range of options that the Movavi Video Editor opens up is really unrivalled – and whether you want to use it to just merge a couple of songs or for something more comprehensive is up to you. If you’re willing to try new things and experiment a little, you’ll find that you could create some fairly impressive music videos or video montages with the features provided.